Oxford University has not always possessed the high reputation in the sciences for which it is now renowned: it was not until the period between this centurys two world wars that science was firmly established in a university previously noted for its devotion to arts subjects. By 1939, despite only modest increases in the numbers of fellows or undergraduates in science, Oxford had developed an important new research identity. This transformation took place in the face of considerable opposition. The powers of the colleges, the poverty of the University relative to collegiate wealth, and the heightened individualism endemic in a polycratic university combined to produce academic conservatism which even in the early twenties, could argue that Oxford should cede science to Cambridge and concentrate on its more traditional strengths in the arts. <br /><br /> Jack Morrell shows how the innovators in the sciences coped with these idiosyncrasies and mustered a variety of resources, including government departments, leading industrialists, philanthropic trusts, and individual benefactors, to overcome academic inertia and to promote their subjects. 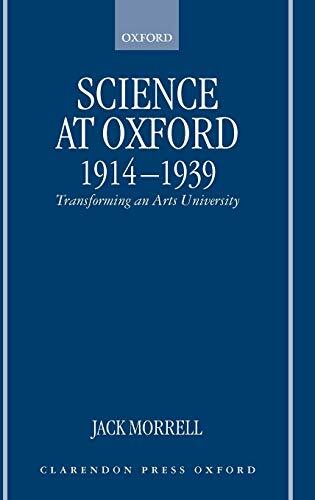 Those interested in the institutionalization of science will find this study particularly important: it is the first book in English to examine the development of all the sciences in a major university of the twentieth century.